• Masala: clove (1sp), cinnamon (2sp) and ilachi (1sp), green chillies (2sp), gas agasalu (3sp), turmeric (1/2sp), salt (to taste) make paste by adding water (3-4sp). 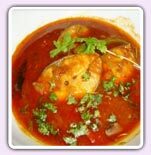 • Apply the masala to fish pieces (200g). • Heat oil (3sp) in pan; add ginger-garlic paste (1sp), and curry leaves (1sp), turmeric (pinch), and marinated fish fry for 2 to 3min. • Now add tamarind water (2cups) cook for 10min and sprinkle coriander leaves.